Nearly 2,500 acres ready for development will be made available to developers, including small and medium-sized building companies, to purchase and get properties built. The tool has been developed by Homes England, the Government’s housing accelerator. “We are determined to help a new generation realise the dream of home ownership which is why we are determined to see 300,000 new homes built a year by the mid-2020s. Over the next 18 months, 148 sites are going to be made available via the online Land Hub with the potential for thousands of homes to be built. The site will include details of the planning status, size and proposed use – such as residential, industrial or commercial – of each site. Getting the whole sector behind the latest innovations in development and building will be key to achieving 300,000 new homes a year by the mid-2020s. Homes England is supporting builders to do this through initiatives such as the Government’s £4.5 billion Home Building Fund, which provides support to builders using modern methods of construction and new, innovative builders entering the market. 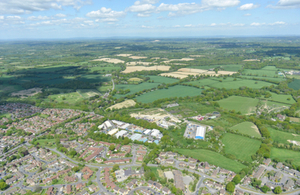 The extra sites being released to developers follows the news that Homes England has agreed a partnership with the Defence Infrastructure Organisation (DIO) to develop land being released by the Ministry of Defence. This has the potential to deliver over 10,000 homes across seven brownfield sites. “This partnership provides another great opportunity for Homes England to intervene in the housing market and make homes happen.